83 Ethiopian immigrants (Olim) land at Ben Gurion Airport. After years of waiting, the dream of Aliyah has come true for 83 Ethiopian immigrants (Olim) who landed at Ben Gurion Airport on Monday. 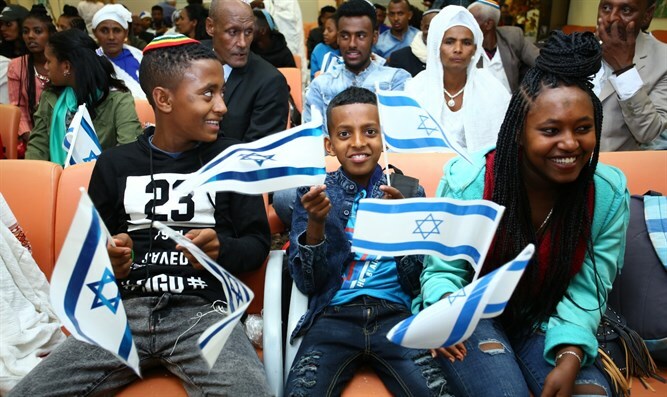 This is the first group of immigrants to come from Ethiopia following the Israeli government’s decision last October to bring 1,000 members of the Falashmura community who already have first degree relatives living in Israel. Upon the flight’s arrival, a reception was held at Ben Gurion Airport in the presence of the Chairman of The Jewish Agency for Israel, Isaac Herzog, who welcomed the new immigrants. At the end of the absorption process on site, the new Olim then had a joyful reunion with their close family members who were on hand to reunite with them as they begin their new lives in Israel together. "The Operation Yehudith campaign to bring Ethiopian Jews to Israel is a very moving moment, and all of Israel welcomes you. I call upon the Israeli government to do everything in its power to bring the rest of the Ethiopian Jews waiting to come to Israel and who are praying to Jerusalem every day,” said Herzog. “The Jewish Agency will absorb, assist and accompany you for the next two years in everything that is needed in order to be able to successfully integrate into Israeli society, to build your home, your future, and the future of your family here in Israel."